PRISMA indicates Preferred Reporting Items for Systematic Reviews and Meta-analyses. aSome studies satisfied more than 1 criteria. bFurther details are listed in eTable 1 in the Supplement. We compared children having bedtime media device use with children not having access to a device. We compared children having bedtime media device use with children not having access to a device. The number of participants was not provided by Hysing et al33 or Jiang et al24; only the results from the statistical analysis were reported. We compared children having access to a bedtime media device with children not having access to a device. National Sleep Foundation. 2014 Sleep in America Poll: sleep in the modern family: summary of findings. https://sleepfoundation.org/sites/default/files/2014-NSF-Sleep-in-America-poll-summary-of-findings---FINAL-Updated-3-26-14-.pdf. Accessed September 28, 2016. Child Protection Fractures Study: methodological quality criteria. http://www.core-info.cardiff.ac.uk/wp-content/uploads/2012/03/Critical- appraisal-form-2014.pdf. Published 2014. Accessed September 28, 2016. Schünemann H, Brożek J, Guyatt G, Oxman A. GRADE handbook. http://gdt.guidelinedevelopment.org/app/handbook/handbook.html. Updated October 2013. Accessed September 16, 2016. Reeves BC, Deeks JJ, Higgins JP, Wells G. Including non-randomized studies. In:Deeks JJ, Higgins JP, Altman DG, eds, on behalf of the Cochrane Statistical Methods Group. Cochrane Handbook for Systematic Reviews of Interventions. Chichester, United Kingdom: John Wiley & Sons Ltd; 2008. Higgins JP, Green S, eds. Cochrane Handbook for Systematic Reviews of Interventions. Chichester, United Kingdom: John Wiley & Sons Ltd; 2011. Royal College of Paediatrics and Child Health. Mums launch parenting products to help manage children’s screen time. http://www.rcpch.ac.uk/news/mums-launch-parenting-products-help-manage-childrens-screen-time. Updated February 11, 2016. Accessed March 1, 2016. Question Is there an association between screen-based media device access or use in the sleep environment, and sleep quantity and quality? Findings A systematic review and meta-analysis showed strong and consistent evidence of an association between access to or the use of devices and reduced sleep quantity and quality, as well as increased daytime sleepiness. Meaning An integrated approach among teachers, health care professionals, and parents is needed to improve sleep hygiene. Importance Sleep is vital to children’s biopsychosocial development. Inadequate sleep quantity and quality is a public health concern with an array of detrimental health outcomes. Portable mobile and media devices have become a ubiquitous part of children’s lives and may affect their sleep duration and quality. Objective To conduct a systematic review and meta-analysis to examine whether there is an association between portable screen-based media device (eg, cell phones and tablet devices) access or use in the sleep environment and sleep outcomes. Data Sources A search strategy consisting of gray literature and 24 Medical Subject Headings was developed in Ovid MEDLINE and adapted for other databases between January 1, 2011, and June 15, 2015. Searches of the published literature were conducted across 12 databases. No language restriction was applied. Study Selection The analysis included randomized clinical trials, cohort studies, and cross-sectional study designs. Inclusion criteria were studies of school-age children between 6 and 19 years. Exclusion criteria were studies of stationary exposures, such as televisions or desktop or personal computers, or studies investigating electromagnetic radiation. Data Extraction and Synthesis Of 467 studies identified, 20 cross-sectional studies were assessed for methodological quality. Two reviewers independently extracted data. Main Outcomes and Measures The primary outcomes were inadequate sleep quantity, poor sleep quality, and excessive daytime sleepiness, studied according to an a priori protocol. Results Twenty studies were included, and their quality was assessed. The studies involved 125 198 children (mean [SD] age, 14.5 [2.2] years; 50.1% male). There was a strong and consistent association between bedtime media device use and inadequate sleep quantity (odds ratio [OR], 2.17; 95% CI, 1.42-3.32) (P < .001, I2 = 90%), poor sleep quality (OR, 1.46; 95% CI, 1.14-1.88) (P = .003, I2 = 76%), and excessive daytime sleepiness (OR, 2.72; 95% CI, 1.32-5.61) (P = .007, I2 = 50%). In addition, children who had access to (but did not use) media devices at night were more likely to have inadequate sleep quantity (OR, 1.79; 95% CI, 1.39-2.31) (P < .001, I2 = 64%), poor sleep quality (OR, 1.53; 95% CI, 1.11-2.10) (P = .009, I2 = 74%), and excessive daytime sleepiness (OR, 2.27; 95% CI, 1.54-3.35) (P < .001, I2 = 24%). Conclusions and Relevance To date, this study is the first systematic review and meta-analysis of the association of access to and the use of media devices with sleep outcomes. Bedtime access to and use of a media device were significantly associated with the following: inadequate sleep quantity, poor sleep quality, and excessive daytime sleepiness. An integrated approach among teachers, health care professionals, and parents is required to minimize device access at bedtime, and future research is needed to evaluate the influence of the devices on sleep hygiene and outcomes. Studies7,8 during the past decade have demonstrated that the use of conventional electronic devices, such as televisions, gaming consoles, and computers, negatively affects sleep. Newer portable mobile and media devices, including smartphones and tablet devices with broader capabilities (eg, internet and social networking), provide a different type of exposure because they allow real-time interaction and therefore continuous stimulation for children, unlike older stationary devices.8 Herein, these newer portable screen-based mobile and media devices are termed media devices. The presence of media devices is almost ubiquitous among children: 72% of all children and 89% of adolescents have at least 1 device in their sleep environment, with most used near bedtime.3,6 Such devices are hypothesized to adversely affect sleep through various pathways.7,8 First, they may negatively influence sleep by directly displacing, delaying, or interrupting sleep time. Second, the content can be psychologically stimulating, and, third, the light emitted from devices affects circadian timing, physiological sleep, and alertness.9 However, the association between media device use and poor sleep outcomes has been underexplored because the speed at which these devices have been developed has outpaced research capabilities.8,9 A previous literature review8 reported a suspected association between screen time and poor sleep outcomes and stimulated debate to assess the quality of evidence and quantify the magnitude of the potential relationship.7 To our knowledge, we present the first systematic review to quantify the influence of media device use on sleep outcomes in a meta-analysis. This study was conducted following Preferred Reporting Items for Systematic Reviews and Meta-analyses (PRISMA) guidelines10 and was performed according to an a priori protocol. All experimental and observational study designs, in any language, published between January 1, 2011, and June 15, 2015, were included. The time frame was selected to reflect the interactive nature of media devices now used. The inclusion criteria were studies of children and adolescents of school age between 6 and 19 years. The exclusion criteria were studies of stationary exposures, such as televisions or desktop or personal computers, or studies investigating electromagnetic radiation. A search strategy consisting of 24 Medical Subject Headings was developed in Ovid MEDLINE and adapted for other databases (eTable 1 in the Supplement). On June 15, 2015, searches of the published literature were conducted across 12 databases, including the British Education Index, Cumulative Index to Nursing and Allied Health database, Cochrane Library, Educational Resources Information Center, International Biography of Social Sciences, Ovid MEDLINE (EMBASE, MEDLINE, and PsycINFO), PubMed, Science Direct, Scopus, and Web of Science. The gray literature was searched using the OpenGrey online database. Bibliographies of included studies and conference abstracts were hand searched, and authors of included studies were contacted to identify any ongoing or unpublished studies. Cohorts of children with access to media devices less than 3 times a week were combined with children who had no media device access and were categorized as having no access to a media device. Children with bedtime access to a media device at least 3 times a week were categorized as having access to a media device. Children who used media devices around bedtime were categorized as those who used a media device. 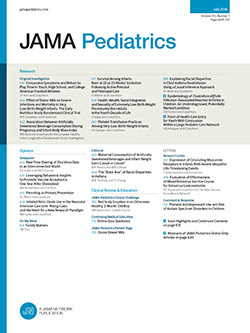 Outcomes were the proportion of children who experienced inadequate sleep quantity (defined as <10 hours of daily sleep for children and <9 hours of daily sleep for adolescents5,11,12), poor sleep quality (defined as frequent difficulty in sleep initiation or sleep maintenance or nonrefreshing sleep13), and excessive daytime sleepiness (defined as poor daytime functioning as a result of both sleep quantity and quality14). Two reviewers (P.R. and M.S.P.) independently extracted data, and a third reviewer (B.C.) resolved discrepancies. Study authors were contacted if incomplete data had been reported and to provide aggregate or individual participant data (IPD). Included studies measured the association between exposure to a media device and the influence on sleep using either linear regression slopes (β), correlation coefficients (r), or odds ratios (ORs). To ensure consistency in interpretation, only studies that reported dichotomous data or logistic regression analyses were pooled in a meta-analysis. Statistical heterogeneity was assessed using the I2 statistic. Heterogeneity exceeding 85% was explored using subgroup analyses.19 All meta-analysis data were presented as OR with the associated 95% CIs, P values, and I2 summary data. Prespecified subgroups to explore heterogeneity included quality assessment (high-quality vs unclear and low-quality studies), age of children (6-11, 12-15, and 16-18 years), and type of media device (cell phone vs tablet). A total of 467 studies were identified, and 69 full texts were reviewed, leading to 49 being excluded (Figure 1). Of 20 studies involving 125 198 children (mean [SD] age, 14.5 [2.2] years; range, 6-18 years; 50.1% male) that were assessed for methodological quality, 17 were included, with 3 excluded because of poor methods conduct or reporting21-23 (eTable 2 in the Supplement). Two studies13,24 were of good quality, 6 studies3,25-29 were of low quality, and 9 studies30-38 were of unclear quality (eTable 2 in the Supplement). Included studies were conducted in Europe (n = 7),13,27,28,30,33,35,38 North America (n = 4),3,25,26,31 Asia (n = 3),24,36,37 and Australasia (n = 3),29,32,34 (eTable 3 in the Supplement). Six studies13,24,26,27,30,33 assessed the association between media device use and sleep during weekday periods only. Five studies3,25,28,32,34 assessed sleep separately on weekdays and weekends, and 6 studies29,31,35-38 aggregated weekly data. Media device investigations were categorized into 2 exposure groups, namely, studies3,13,24,27,28,30-33,35,37,38 that reported bedtime media device use and studies3,25-27,31,32,35 that described children who had access to (but did not use) media devices at night. One study36 presented data on the use of media devices throughout the entire day, which is not reported herein. Individual study results grouped by device exposure category are listed in eTable 4 in the Supplement. We identified 12 studies that investigated the use of media devices near bedtime (eTable 4 in the Supplement). Eight studies reported that bedtime media device use was significantly associated with inadequate sleep quantity (P < .05). Seven of the studies reported an association between bedtime media device use and poor sleep quality (P < .05), and 1 study35 reported that bedtime media device use was associated with improved sleep quality. Four studies that presented data on excess daytime sleepiness demonstrated statistically significant results (P < .05). In 7 studies,3,13,27,30-32,35 the prevalences of inadequate sleep quantity among the 2 groups were 45.4% (children having bedtime media device use) and 31.5% (children not having access to a device). The pooled OR was 2.17 (95% CI, 1.42-3.32) (P < .001, I2 = 90%) (Figure 2). The large heterogeneity was due to the study by Chahal et al,31 which recruited only 10-year-old and 11-year-old children. After that study was excluded, the OR was 2.52 (95% CI, 1.79-3.55) (P < .001, I2 = 72%). Two studies3,27 were included in an IPD meta-analysis, and the age-adjusted OR (aOR) was 3.06 (95% CI, 2.01-4.70) (P < .001). Two studies3,32 reported dichotomous data on excess daytime sleepiness, and the prevalences were 21.3% (children having bedtime media device use) and 6.7% (children not having access to a device). The pooled OR was 2.72 (95% CI, 1.32-5.61) (P = .007, I2 = 50%) (eFigure 1 in the Supplement). There was an increased odds of excessive daytime sleepiness among children who used a media device near bedtime. Most studies reported statistically significant evidence of an association between the presence of a media device in the sleep environment near bedtime and inadequate sleep quantity (6 of 7 studies), poor sleep quality (4 of 6 studies), and excessive daytime sleepiness (3 of 4 studies). These results are summarized in eTable 4 in the Supplement. Dichotomous data were available from 4 studies3,25,27,32 that investigated poor sleep quality, and the prevalences were 44% (children having access to a bedtime media device) and 32.4% (children not having access to a device). The OR was extracted from 2 studies.26,35 The pooled OR for poor sleep quality was 1.53 (95% CI, 1.11-2.10) (P = .009, I2 = 74%) (eFigure 2 in the Supplement). There was an increased odds of poor sleep quality in children who had access to a media device in the sleep environment near bedtime. Dichotomous data were available from 3 studies3,25,32 that investigated excessive daytime sleepiness, and the prevalences were 13.2% (children having access to a bedtime media device) and 4.9% (children not having access to a device). The OR was extracted from an additional study.35 The pooled OR for excessive daytime sleepiness was 2.27 (95% CI, 1.54-3.35) (P < .001, I2 = 24%) (eFigure 3 in the Supplement). There was an increased odds of excessive daytime sleepiness in children who had access to a media device in the sleep environment near bedtime. There were no subgroup associations found owing to the quality of included studies or type of media device. Similarly, there was no subgroup association for the age of the children, although most were between 10 and 18 years old. The GRADE assessment of included studies was low because of their nonrandomized nature. The assessment of the findings was upgraded owing to the large effect sizes found but was downgraded because of the substantial heterogeneity. Therefore, the level of evidence is low, meaning that the results may change on publication of further evidence. To our knowledge, this study is the first systematic review and meta-analysis to quantify the association of media device access and use with children’s sleep. We found that bedtime device use was associated with an increase in the odds of inadequate sleep quantity, poor sleep quality, and excessive daytime sleepiness. Media device presence in the bedroom (even without use) was also associated with an increased odds of detrimental sleep outcomes. These findings herein support current clinical opinion that media device access and use result in poor sleep outcomes. The limitations of research in this area include measurement error of self-reported data, difficulty in ascertaining causality, isolation of the influences of specific exposures, technological devices outpacing research, and weaknesses inherent to observational study designs. Substantial heterogeneity was found in many of the meta-analyses and is likely a reflection of the included nonrandomized studies. Therefore, a degree of caution is needed when interpreting these findings. The deleterious association between screen-based media use and sleep in children and adolescents is a major public health concern. Given the evolving technological landscape and the replacement of textbooks with media devices in schools, screen-based media device access and use are likely to rise. It is imperative that teachers, health care professionals, parents, and children are educated about the damaging influence of device use on sleep. Policy-led population-level health promotion to not stigmatize individual children but guide communities to promote the importance of sleep hygiene is needed. In addition, we encourage screening of children during routine clinical visits (by health visitors, school nurses, or family physicians) to identify those with inadequate sleep to explore device use as a potential cause and target sleep hygiene promotion. Multidisciplinary interventions to improve sleep hygiene have been investigated40,41; however, pragmatic studies are needed to understand the mechanism of action and causal pathway between device use and sleep using objective data collection methods. Interventions could be delivered by family physicians as a part of routine care for those seen with health concerns and by teachers who introduce devices into education.41 Device technologists should investigate software and parent-led interventions, such as automatic time switches to restrict access to media devices near bedtime. Interventions and policies must be developed, evaluated, and implemented at the population level to raise awareness of the potential health hazard to improve sleep hygiene through an integrated approach involving teachers, health care professionals, and parents. Media device access and use at bedtime are significantly associated with detrimental sleep outcomes and lead to poor health outcomes. We recommend that interventions to minimize device access and use need to be developed and evaluated. Interventions should include a multidisciplinary approach from teachers and health care professionals to empower parents to minimize the deleterious influence on child health. Corresponding Author: Ben Carter, PhD, MSc, Department of Biostatistics and Health Informatics, Institute of Psychiatry, Psychology and Neuroscience, King’s College London, Strand, London WC2R 2LS, United Kingdom (ben.carter@kcl.ac.uk or carterbr@cardiff.ac.uk). Author Contributions: Dr Carter had full access to all the data in the study and takes responsibility for the integrity of the data and the accuracy of the data analysis. Study concept and design: Carter, Paradkar. Drafting of the manuscript: Carter, Rees. Administrative, technical, or material support: Carter, Rees, Bhattacharjee, Paradkar. Funding/Support: This research is funded in part by grant R01HD073352 from the Eunice Kennedy Shriver National Institute of Child Health and Human Development (Dr Hale).